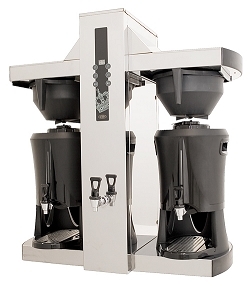 Fast and easy to handle bulk brewer with hot water tap. 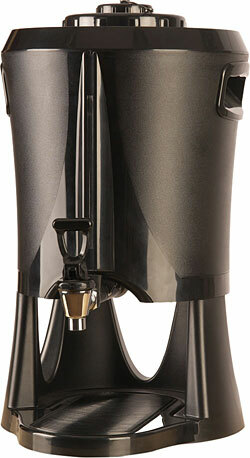 One uniquely designed 5 litre serving station (vacuum thermos) with tap, sight gauge and integrated handle grip. The serving station also have rotating function for easy handling. Option for full- or half brew and brewing complete signal. Full brewing 5 litres takes approx. 7 minutes. Fast and easy to handle bulk brewer with hot water tap. 2 uniquely designed 5 litre serving stations (vacuum thermoses) with tap, sight gauge and intergraded handle grip. 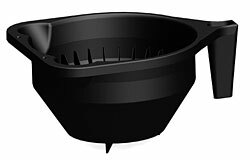 The serving station also have rotating function for easy handling. Brewing on both sides at the same time. Option for full- or half brew and brewing complete signal. Full brewing, 10 litres takes approx. 7 minutes. Manual water filling. 1 pc serving station 2,5 litre with sight gauge, tap and brew-thru lid. 25 pcs filter paper are included. Automatic water filling. 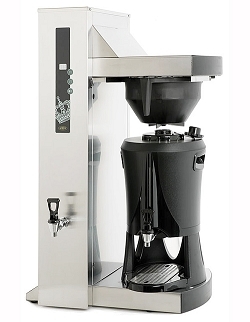 1 pc servingstation 2,5 litre with sight gauge, tap and brew-thru lid. 1,5 metre connection hose and 25 pcs filter paper are included. Electronic time control. Adjustable amount of brew 4-12 cups and brewing complete signal. Servingstation with brew-thru lid, complete with sight gauge and tap. Volume: 2,5 litres. Display cover for serving station 2,5 liter. Branding not included. Serving station for Tower with tap and sight gauge. Designed display cover in black plastic for branding of serving station. Branding not included. Image for display cover 5 litre. Lid not included. Filter holder in stainless steel. Filter paper 90mm in box of 1000 pcs. Fits Original line and Mega Gold. Disposable filter paper 110 mm in box of 1000 pcs. Fits Cater. Filterpaper 523 for Tower. 500pcs/box. Water Connection kit for Mega Gold A. Can be used for other models of Original Line with automatic water connection. 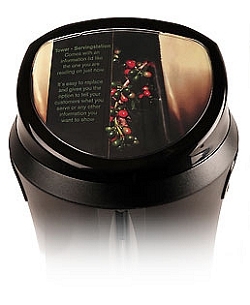 For Espresso machines & Serving stations. Dosing for serving station 2,5 litre, 1 tablespoon and serving station 5 litre 2 tablespoons of powder mixed with hot water. Cleaning brush for serving station.